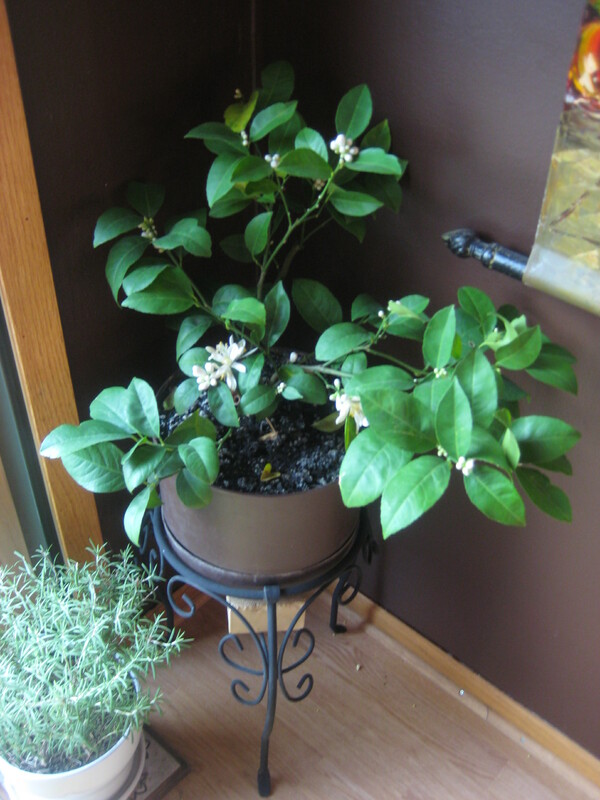 In spring of 2009 I purchased a Dwarf Meyer Lemon Tree from Gurney’s. For $9.99 I could grow citrus in my own home, here in Wisconsin. What fun! Meyer Lemon tree during it's first summer. 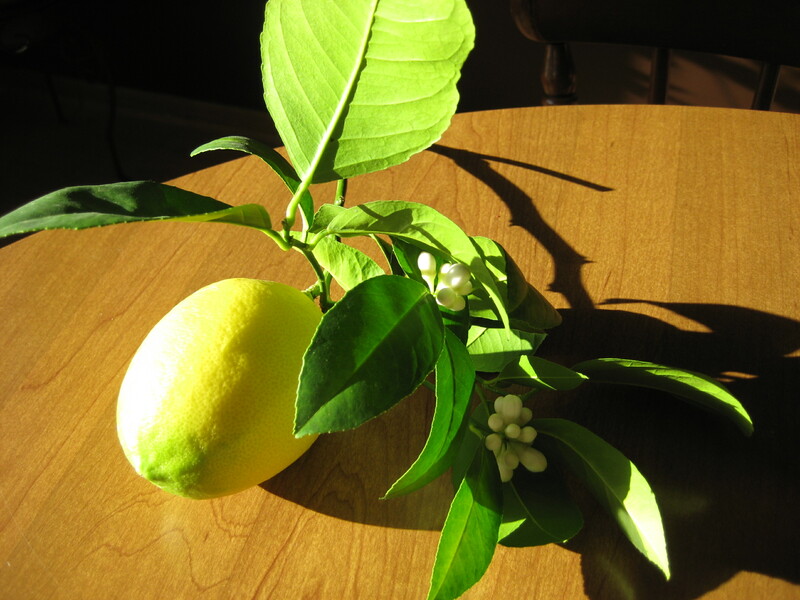 The lemon tree spent that first spring and summer outside, soaking in the sun and becoming healthy and strong. 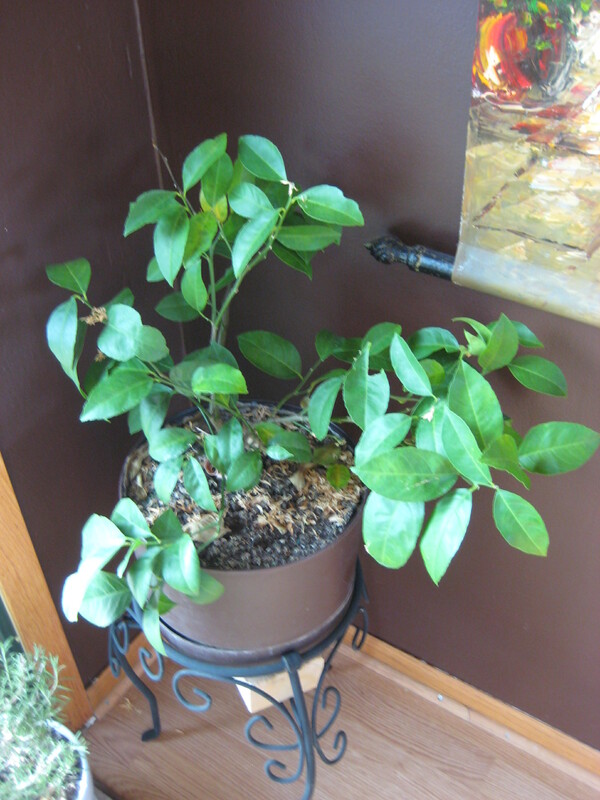 September came around (it was a very cold fall here in Wisconsin that year) and the lemon tree moved indoors to overwinter with us in the comfort of our heated home. Lo and behold that lemon tree blossomed! I used a paintbrush to help it pollinate, after all we don’t have any bees in our house to do that duty. I dutifully misted the tree to simulate the humidity it would have in it’s natural (much more tropical) environment. I fertilized the tree and generally babied the thing. And for all my hard work and dedication? It produced one lemon. Well, actually two. But I picked one while it was green* so that the lemon tree could put all its effort into that one special lemon, after all they were growing on the same tiny branch, fighting each other for nutrients and whatever else lemons need to become plump and yellow. And so the day arrived, and that one precious fruit was plucked from the tree. Being a special lemon, I wanted to make sure it’s lemon-ness was showcased in the evening’s meal. 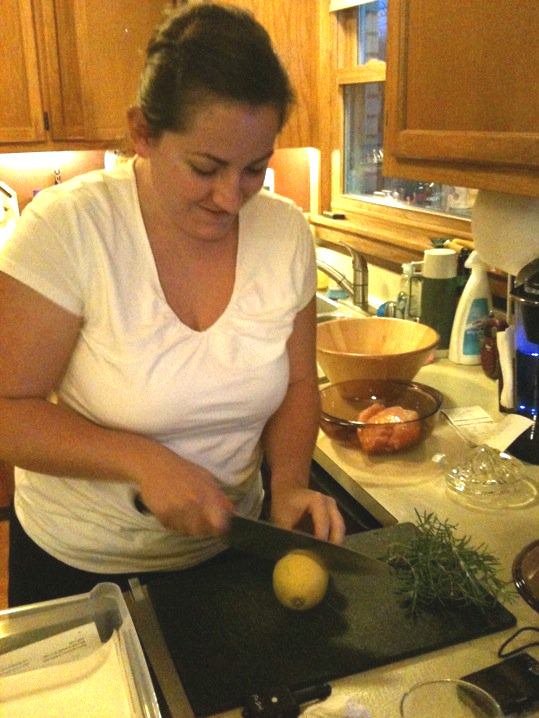 My brother was here for the occasion and snapped this photo of me preparing our lemon rosemary chicken. Slicing into the prized fruit. The meal was delicious, as most meals showcasing lemons tend to be. Will there be a lemon in 2011? I’m not sure. Here is the tree in early December, loaded with fragrant blossoms. Lemon tree preparing to burst with blossoms, early December. 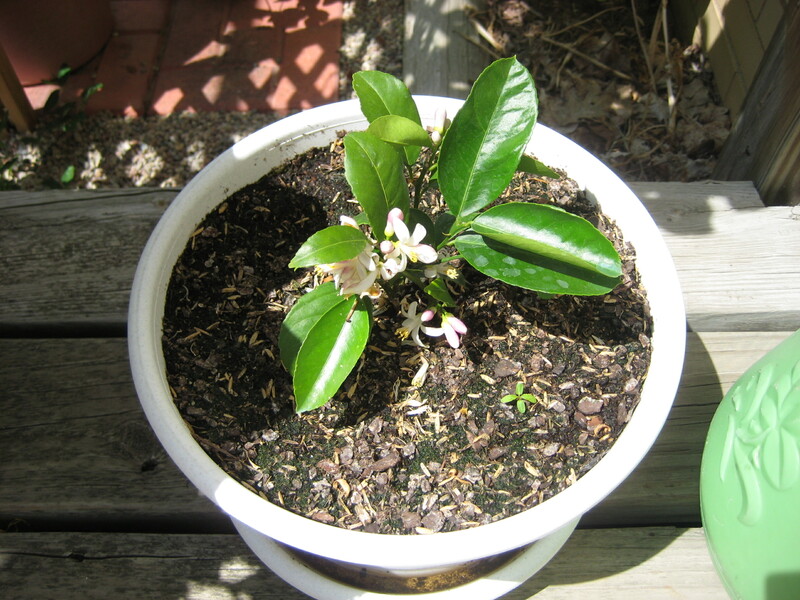 Blossom of the Dwarf Meyer Lemon Tree. And here is the tree now, noticeably void of blossoms and tiny green baby lemons. In order to justify the $9.99 spent on this lemon tree, it needs to grow about 19 more lemons. But then, if we are being honest with ourselves, we gardeners can forgive a multitude of monetary sins in exchange for the pleasure our plants give us. This lemon tree, though it hasn’t beared it’s fair share of fruit (yet–I’ll keep hope alive) has provided me with its beauty and perfume and in a weird way, companionship. I tend to that plant nearly every day, and I sort of look forward to it. Perhaps it will repay me with more lemons one day, but if not… I’ll still love it. 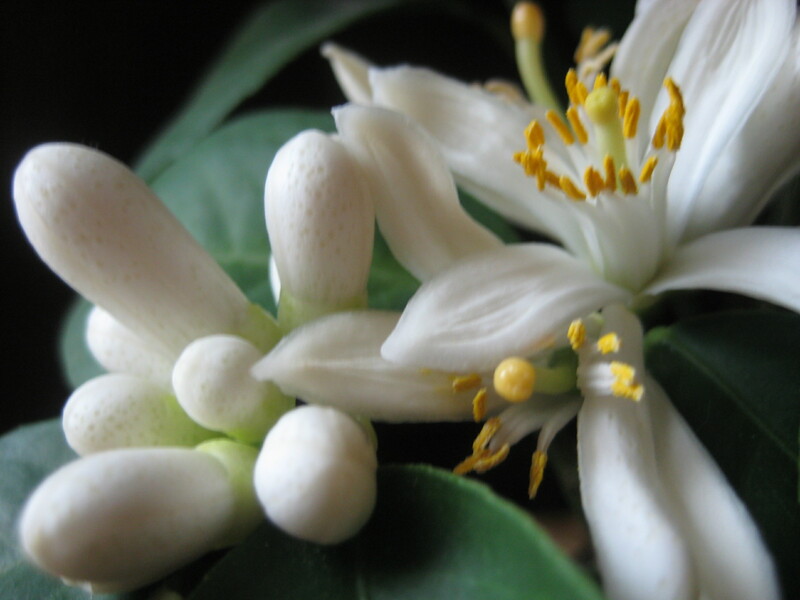 This entry was posted in Fruit and tagged cooking with lemons, dwarf meyer lemon, lemon blossom, lemon tree, lemon tree care, meyer lemon. Bookmark the permalink.